Onions a-plenty from the allotment this year and today was harvest day. 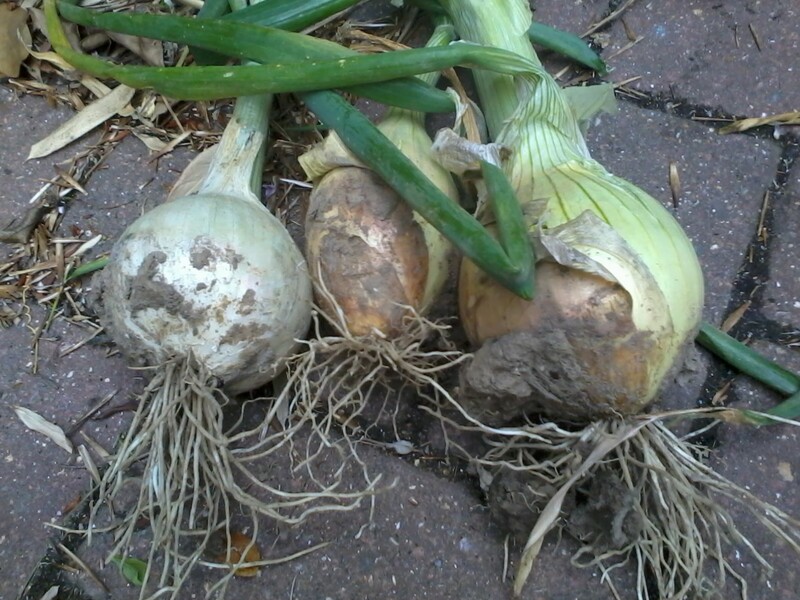 When I dug over the ground last Autumn I found three tiny onions and I tucked them back in a corner. There were some impressive storms in the run-up to Christmas and the flood barrier upstream couldn’t cope. The ground flooded to a depth of two feet but they hung on in there, sprouted again in the Spring and grew into these whoppers. The variety is Ailsa Craig. Also in the ground during the flooding were garlic and elephant garlic. I had dug over a small patch of ground but knew that I would not have found all the couch-grass and bind weed roots. I therefore tried covering the ground with some weed-cover fabric and planted the cloves of both through little slits in it. The trick worked really well, but I think I should have cut away the fabric a little earlier than June, hoed in between and fed them. The true garlic didn’t do so well. 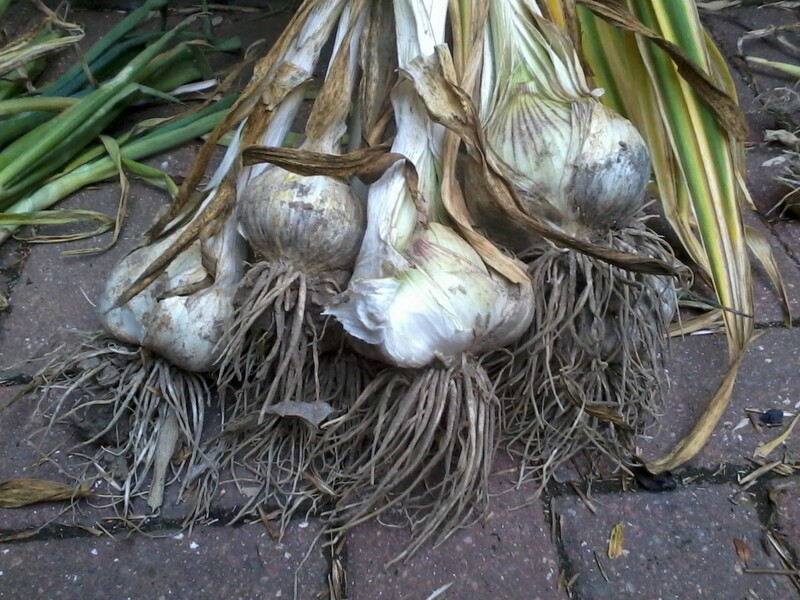 The plants grew well but the bulbs have barely formed and the individual cloves are small. Other allotmenteers have reported worse results with everything rotting so I’m better off than some. The elephant garlic is great though. We had a couple of them roasted whole on the barbecue last weekend. Today I dug up the remainder and brought them home. 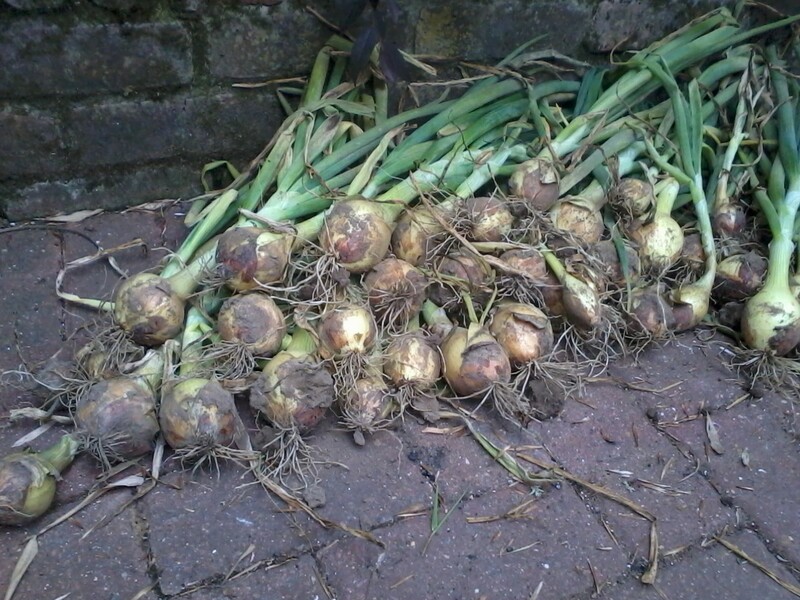 The bulk of the onion harvest though comes from fifty sets (tiny onion bulbs) of “Sturon” that I put in on 24 March. The tops were starting to die back and current advice seems to be not to bend the tops over but just to dig them up and lay them on the soil. I decided I would rather bring them home and lay them out on the patio to start the drying process. I do still have some onions in the ground – the ones started from seed in February. Hopefully they will come to something, if only for pickling. They are only a good spring onion size so far. I suppose I can always move them like the three from last year. I don’t want to give you the idea that I know what I’m doing here. I’m pretty new to this whole vegetable growing thing. I’m making it up as I go along. Tonight I’ve used some of the smaller onions, garlic and courgettes from the allotment along with a bought aubergine, red pepper and chopped tomatoes to make a ratatouille for dinner. Served with pasta and grated parmesan cheese. This entry was posted in Allotment, Food and Cooking and tagged cooking, ratatouille, vegetables. Bookmark the permalink.